Kamiko review — Kelleher Bros. Everywhere I saw Kamiko recommended, they called it “Zelda-like”. But I really don’t think that’s the best comparison. The game is certainly a topdown action RPG, with combat in a similar style to Zelda or Secret of Mana, but that’s mostly where the comparison ends. Sure, there are arguably some puzzle elements contained in Kamiko’s stages—and each stage ends with a boss fight—but the overall experience bares only a passing resemblance to Zelda. 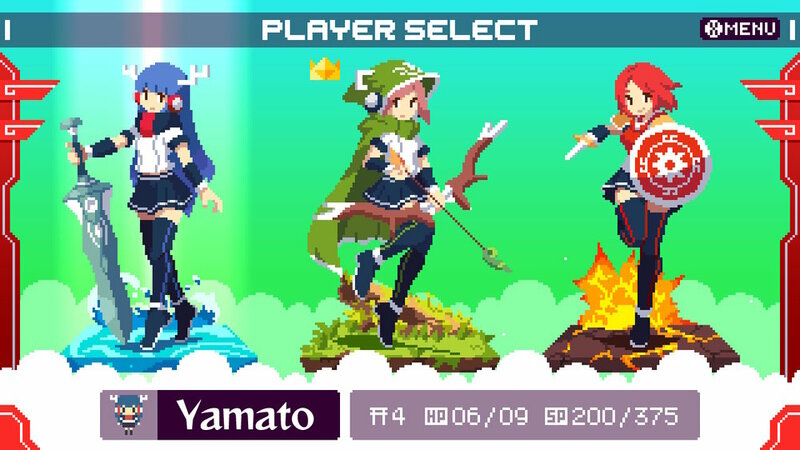 I’d say that Kamiko is just as similar to Gauntlet as it is to a Zelda game. One of the enemies, in particular, looks like he came straight out of Gauntlet. To be clear though, I don’t mean this as a criticism. Kamiko is its own game, and it doesn’t to be Zelda to be great. Kamiko’s overall atmosphere, for example, is quite unique. With its clean pixel art and chill music, I honestly found the game to be legitimately relaxing. This is a truly laidback dungeon crawler. The developers do a fine job at creating a consistent feeling game world, with minimal in-game dialogue to provide just enough context for the adventure. This definitely a game worth playing in general, but if you’re looking for a smoothing experience for a cross-country flight, it is absolutely perfect! Finally there’s a red-clad woman armed with a short sword and shield. Her shield is actually thrown (like Captain America or Rygar-style), as her primary attack, and the short sword used in close-quarters while the shield is away. This third character is kind of like a hybrid combination of the other close-ranged and long-ranged options. Kamiko is fairly short game, with four levels to tackle. There’s the green forest area to start, then a watery flooded urban area, next a fairly standard volcanic labyrinth, and finally there’s the dreamy ruins of city overgrown with moss and vines. Each area is visually distinct and the puzzle-like layout built into their designs is unique, so there’s a nice variety to play through. Gameplay in Kamiko consists of fighting (mostly cute) monsters while exploring each area to active four shrine locations hidden therein. Each playable character has a simple three-hit combo attack, as well as a big charge-up attack that hits multiple enemies at once. Weaker enemies can be killed with one hit, while stronger monsters will take two or three hits. Each time an enemy is dispatched, they drop little blue energy pellets which are then automatically drawn to the player and collected. By killing multiple enemies in succession, you can rack up a combo and each enemy will drop more energy pellets the longer combo you have going. The energy meter (displayed just below the player’s health) keeps a count of how much energy you currently have collected. This energy is spent when you open a chest, activate a shrine, or use your big charge-up attack. So you if you find yourself unable to activate a shrine at some point, you probably just need to kill a group monsters and refill your energy gauge real quick. Each level is its own dungeon puzzle—with switches, keys for unlocking doors, orbs that need to be placed on pedestals, warps to inaccessible sections, that sort of thing—and they always end with a boss fight. There are also a few power-ups that can be found throughout the game which will increase your maximum health and energy gauge. None of the puzzles felt overly complicated to figure out, but things never felt overly easy either. This game has a satisfying balance of challenge and reward. Each level boss has the own gimmick to exploit, though damaging the boss usually boils down to your standard “aim for the red glowing part” strategy. Still a good time. With a price tag of just $5 on Nintendo’s eShop, I wasn’t expecting too much from this title, but it certainly exceeded my expectations. Kamiko is a charming, stylish, surprisingly relaxing little dungeon crawler at a budget price. If you’re in the mood for a topdown action RPG, this bite-sized game might satisfy the itch.